it will set upright diodes in colums. eg. 0b11111111 will light up 1st column ? i tried to display moving text in 2 led displays. Hello, it's a few that i do not look at this library, anyway, you can simply use the ledmatrix7219d88_setled function, but if you are trying to reduce the number of operation involved, i think you have to tweek around the max7219 library to. Which program did you use for your schematics file? I can't open it and the image makes no sense compared to other images online. I tried to run the code at it's not working the same as in the video. My wiring must be different since I do not have the matrix + chip module for the led display. Thanks! I'm just having a hard time getting it to work. Everything should be wired properly but all it does is turn all LEDs on then off instead of a fancy loop. Hello, you can check it with a scope, or a logic analizer, what's going on over the bus. Then you will understand why this is not going. Or you can use uart as a debug output interface, sending to your terminal register status, or any kind of debug messages that may help you. This is not working.I checked this through the Proteus simulator as in the schematic and programmed it in the Winavr programmers notepad.But nothing works.And tried it on Atmega32 and Atmega8 both.Can you please help me regarding this. In the program it has called the interrupt header but haven't called a interrupt in the program. Are the pins connected in the schematic are correct? Hello, this works for me as you can see for ATmega8 on presold MAX7219 matrix led board. I've also test it on clean MAX7219 and leds. Unluckly i do not use Proteus. You can check your micro to MAX7219 bus using a logic analizer, to assure that the output is working. for the max7219 is it possible use it only with i2c? Hello, no, but by datasheet the MAX7221, which is similar to the MAX7219 is compatible with SPI, QSPI, and MICROWIRE. 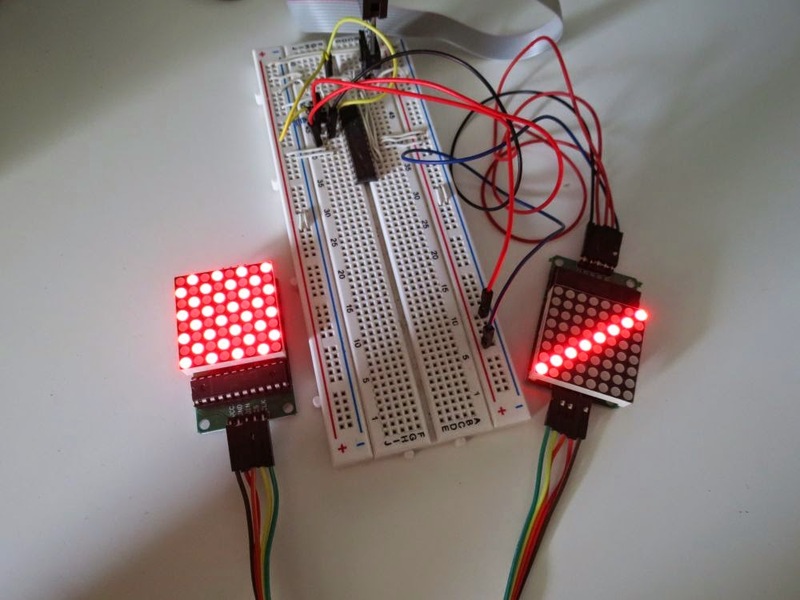 Hello, this is simply a library to drive 8x8 matrix led. You can use to show text message, yes. Hello, I'm facing some authentication problem while downloading the library from sourceforge.Could you share it on github or google drive please. dot matrix p10 panel, code vision, atmega16. 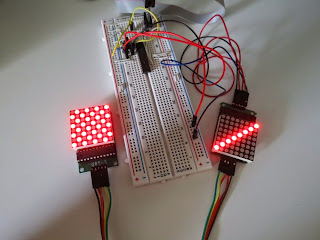 The led blinking works for only two cloumns rest of the 6 columns wont blink, but it takes the time required to blink other 6 columns then repeats blinking the two columns. can you give me any hint why is it so?